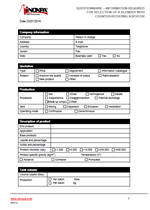 These units are intended primarily for pharmaceutical, cosmetics, food and personal care products industries. They are ideal for processes which require heating, vacuum, premixing, additions, vigorous agitation, emulsion or dispersion, as well as pressure and temperature. The skid can work at -1 to 0.5 bar and the double jacket - up to 3 bar. The operating temperature is between -7 a 120 ºC. 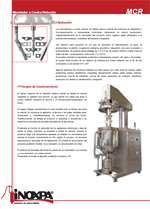 It is possible to control the following parameters: temperature, pressure, pH, weight and viscosity. 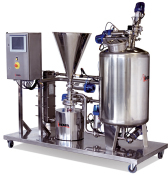 The unit is provided with a cleaning system with rotating spray balls in order to be connected to a CIP and SIP cleaning system. Some examples of products that can be treated with these units are all kinds of creams, gels, sunscreens, depilatories, makeup, deodorants, sauces, pates, pastes, shoe creams, emulsions, paraffin mixtures, wax mixtures, carbopol dispersions, tooth pastes, products intended for drugstores and parapharmacies. 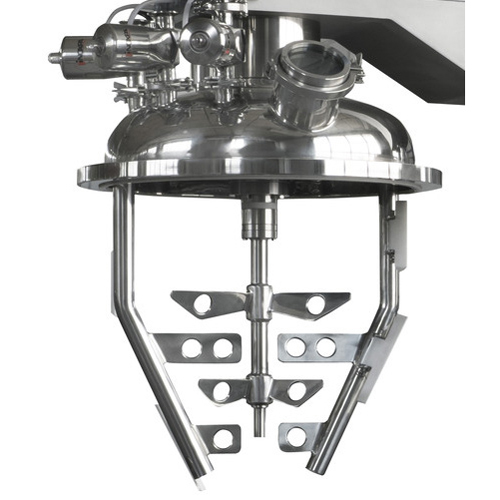 The unit has a sealed tank where mixing takes place by means of an anchor type agitator, a central shaft with counter-rotating blades that move in the opposite direction to the anchor, and an emulsifying disperser located at the bottom of the shaft. 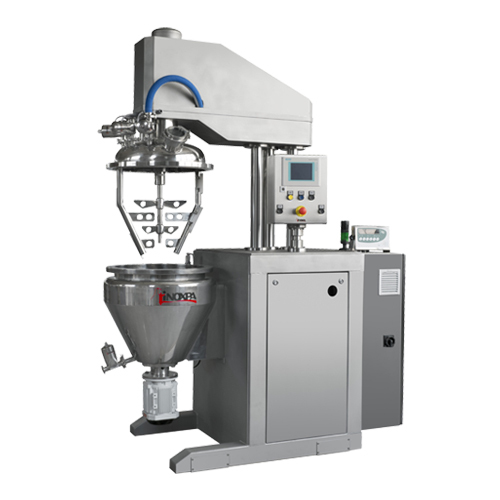 The unit normally operates under vacuum during the entire duration of the mixing process. When the agitation starts, the anchor and the central blades rotate slowly while the bottom mixer is put into operation. Subsequently, the product to be dispersed or emulsified is added and the speed of the blades on the central shaft is increased. When the mixing is complete, the agitator speed decreases and the bottom mixer is stopped; at the same time the chamber begins to cool down. 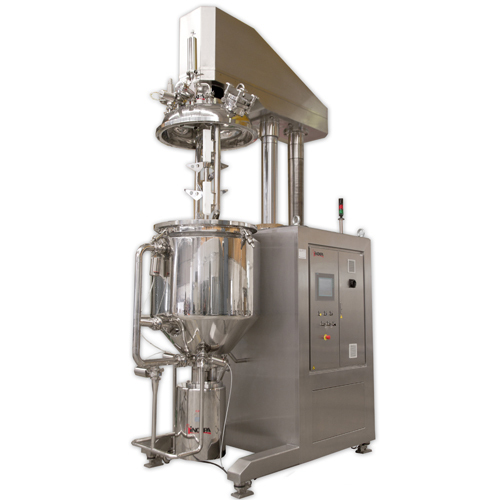 When the product reaches the desired temperature, any required additives are added to the mixture, typically when cold; depending on the process, the speed of the agitators may be increased slightly. It is possible to recirculate the product and, if necessary, an emulsifier can be added to the process. The product discharge system can be by gravity or with a pump and, if necessary, using positive pressure. Finally, the tank is cleaned by the CIP system. These units are available in 3 arrangements: on support base, on support feet and a metal structure, or on concrete floor, with or without automatic lid lifting. The units with support bases are designed to accept all auxiliary equipment necessary for the unit to operate autonomously. These units are built to FDA standards. For good temperature control, the system includes a PT100 or 4-20 mA temperature probe located on one end of the central shaft of the agitator in order to obtain product temperature data. Its reliability is excellent because of its distance from the boiler walls in contact with the hot and cold chamber. It has a second probe located in the heating and cooling chamber to control the latter. Support system and lid lifting system.